When she was laid down at J.C. Tecklenborg of Geestemunde, this Norddeutscher Lloyd ship's name was to be Washington; by the time she was launched in October 1907, however, she had been renamed Prinz Friedrich Wilhelm. Her maiden voyage began on 6 June 1908, and was from Bremen to New York, with stops at Southampton and Cherbourg. She made her last NDL voyage on that route in June 1914, and was in the midst of a cruise to Norway when World War I began in August. She went aground trying to return to Germany, and subsequently was interned at Odda, Norway. 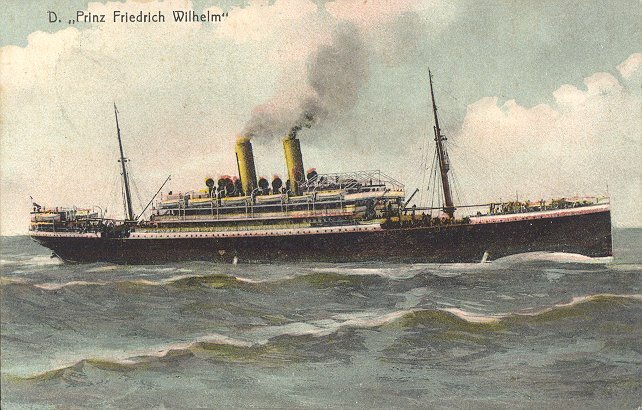 Prinz Friedrich Wilhelm attempted to escape from her internment in 1916, but again went aground and was then laid up at Kiel. At the war's end, she was ceded to Great Britain as a war reparation, and was initially charted to the U.S. government for troop repatriation service. In 1920, she was placed under Canadian Pacific management and made her first Liverpool-Québec trip on 14 July 1920, still under her NDL name. After three such trips and one from Bombay to Canada, the ship was purchased by Canadian Pacific and renamed Empress of China III. That name, though was already being registered as the new name of Hapag's Tirpitz, so she became Empress of India II. She returned to service in August 1921 under this name but on charter to Cunard, for whom she made two Southampton-New York sailings. She finally made her first regular Canadian Pacific sailing on 23 June 1922, making three trips to Canada (two from Liverpool and one from Southampton) before being refitted for cabin class service at the end of the 1922 season. 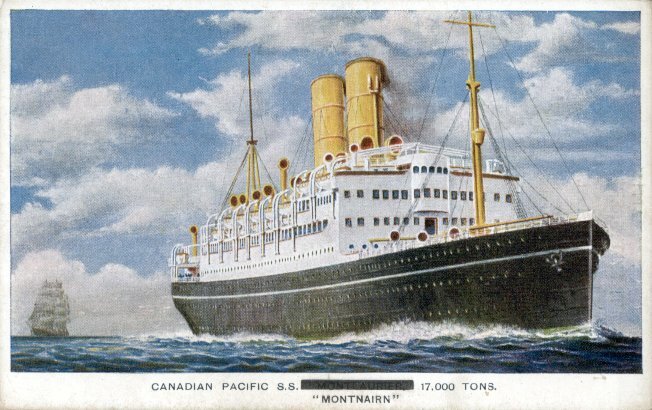 She returned to service in 1923 with yet another name, Montlaurier, and remained on Canadian Pacific's Liverpool-Canada service until 1925. She then required repairs after steering gear damage stranded her at Cobh and caught fire while those repairs were being made. During these repairs she was renamed twice. She never sailed as Monteith, but returned to service in July 1925 as Montnairn. In 1927, her eastern berth was moved to the continent and she commenced service from Antwerp. Her final sailing, in July 1928, was from Hamburg to Québec; on her return, Montnairn was laid up at Southampton. She made a total of 62 North Atlantic roundtrips for Canadian Pacific. Montnairn was scrapped at Genoa in 1929.